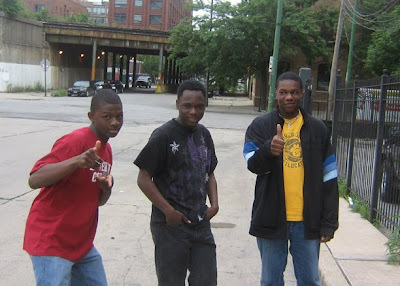 Well, Chicago's youth made national news again this week. But not in a very positive way, I'm afraid. I'm sure you've all seen the amateur footage taken in the savage and fatal beating of Fenger High School honors student Derrion Albert. If not, just Google it and easily find a network near you that is happy to indulge you with gruesome footage of kids killing kids. "Why does this happen? Why are we so damn violent? And especially children, 15, 16, 17, 18 years old, what would cause them to have this much rage, this much hate?" Holt responded that to understand the anger, we need to first address "the core of the problem," explaining that, "A dysfunctional parent can only develop a -- a dysfunctional child within a dysfunctional home... And you have to find a cure for that parent, who doesn't -- who lacks the life lesson skills and management to pass along to those children." ..."your first known teacher is your parent or grandparent... Are they equipped with life lesson skills to pass on to those children to raise them properly? ... you have to go back to the core of the problem, and you have to treat it there. Some of these children... They're not nurtured at home. They are miseducated. They get out here in the streets. They don't have a ... positive male role model in their home or in their lives..."
Sanchez challenged this, in classic nature vs. nurture fashion, proclaiming that, "something's got to be real wrong with a person who at that moment continues to do something like that and almost revel in it as I saw in that videotape that goes beyond parenting and social skills, does it not?" Holt tried to argue that it's not that simple, stating that, "it has to start somewhere. And that's the nucleus of it..."
Holt then shared his belief that there is indeed "an unsalvageable criminal element out there that has made crime and violence a daily reality for a lot of law-abiding citizens in our country." "I'm going to stop you with that word. 'Unsalvageable' is what you just said. 'Unsalvageable.'" He continued, "And you know what? I think you're right. I agree with you. I think there are people out there who could possibly very well be unsalvageable. And maybe we as a society need to start treating them as if they are just that, unsalvageable." Well, assuming most people reading this blog buy into the notion that kids living in poverty are "salvagable" (and certainly not "dispensable")... and that some people prefer to get their knowledge from real academia-reviewed and statistically-sound sources, versus random Twitter messages and talking heads, please check out the book American Apartheid, by Douglas Massey and Nancy A. Denton. I've mentioned this book on this blog in the past, but Chapter 6 seemed important for this discussion in particular. 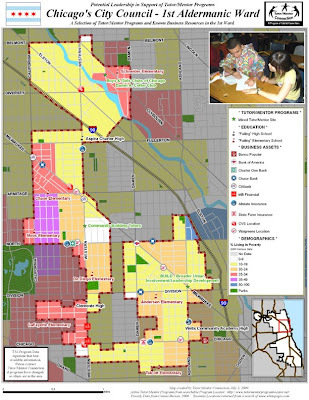 The chapter, "The Perpetuation of the Underclass," goes into great detail - rooted in statistics and history - about how opportunity and social mobility in hyper-segregated high-poverty neighborhoods have been systematically curtailed throughout history - by politicians and others (the book uses Chicago as a case study)... the book shows how generation after generation, families in these neighborhoods have faced unique barriers to resources such as jobs and education... and that their political and spatial isolation, combined with generations of hopelessness and frustration have created not only anger, but - as the author argues - alternative value systems that occasionally get the kids in trouble. Simply put, to end this cycle - and ultimately curve (if not end altogether) poverty and violence, we need to address the "core of the problem" and help kids make better life choices in many cases. We need to help them place better value on themselves and their futures. We need to equip them with the tools to succeed if they choose to pursue career or educational dreams. Tutoring and Mentoring Programs would clearly fit into any comprehensive solution that acknowledges this definition of "the core of the problem." The problem is, we're only talking in sound bytes and tweets these days. 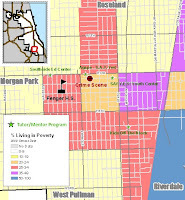 Spend some time looking at the maps on this site and you'll see there are very few tutor/mentor programs in most neighborhoods. Read some of the stuff Dan Bassill posts on his blog (he's the president of Tutor/Mentor Connection, a 30-year veteran of such work, and my personal boss and mentor) and you'll see diagrams that try to help make sense of this complex problem, requiring complex thinking, and involvement at many places, at the same time, and for many years, to get to the core of the problem. Unless people like us are willing to spend time learning (which still means 'reading'!)... and reflecting... not much will change. We can't let the "problem" be spoon fed to us! Unless we then look for ways every day where we can use the available time and talent and money needed to build the systems, and link the world to systems that can address poverty and crime, not much can change. If you just found this blog, browse my tags at the right there to find maps/stories that show how Tutor/Mentor Programs and our maps work, toward addressing this core problem. You'll also find links to others who are thinking about this topic (not just me and Dan and Tutor/Mentor Connection). Meantime, it is my hope that Officer Holt is doing something consistent to raise visibility and support among those in his ranks... and with his access to media muscle... to support programs and leaders that work in concert with tutoring/mentoring. And we hope you stand up and do something. 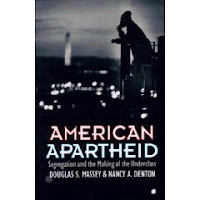 Buy American Apartheid and give it a read. Challenge the community leaders you know to support new and existing programs. Donate to help Tutor/Mentor Connection and Mapping For Justice continue their work. Use my maps or the online program locator we built to find a program near you, and enlist to help fight the core of the problem. Well the first few weeks of our fundraiser have gone pretty well... a lot of people really stepped up for Mapping For Justice. We're currently 1/3 of the way there, and while your generocity has been so appreciated, we need to find new donations to meet our goal of $5000 by October 15. 1. While greatly appreciated, you don't have to donate $25, $50, or the whole $5000... ANYTHING helps. If $5 is all you have to give to tutor/mentor programs and this mapping project, it will help move us toward our goal and be extremely appreciated. 2. Please continue to spread the word to friends in your network who have an interest in fighting poverty, and an interest in student advocacy. Have them contact me personally, or send them to this blog, via your personal social networks (like facebook)... this is something that is free and easy, and is extremely helpful! These three students work with me Tuesday Nights in "Tech Club" at Cabrini Connections Tutor/Mentor program. I volunteer, off the clock, and have gotten to know each of them really well. See if you can guess which 9th grader here is an aspiring rock star, which is writing a fantasy novel, and which has created a video game? They also continue to learn mapping skills, and with this skill, might one day advocate on their own behalf, due to the Mapping For Justice connection, which you can help support by contributing what you can to the fundraiser. The maps you help support show where High Poverty + Low-Performing Schools = Need for Tutoring/Mentoring. The news tells us of violence everyday, further stigmatizing neighborhoods where aforementioned novelists, musicians, game creators, and future community advocates live. 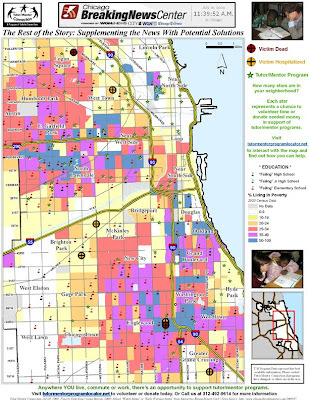 The maps you help support tell "the rest of the story": It's a story of where community leadership needs to provide more mentor-to-career support for capable kids who might otherwise turn to the street for guidance. 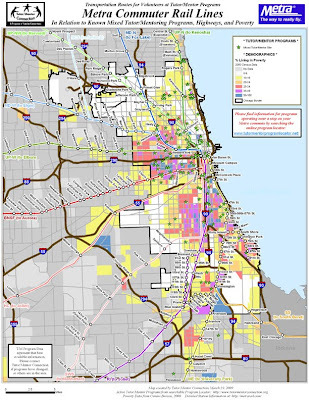 Our maps help political and business leadership visualize the lack of tutoring/mentoring options for youth, and serve as a starting point for the formation of strategies and alliances that work to SOLVE THE PROBLEMS related to crime, poverty, and workforece development, not simply expose it. You might not have to dollars these guys do, but every little bit helps us continue to provide supporting maps. 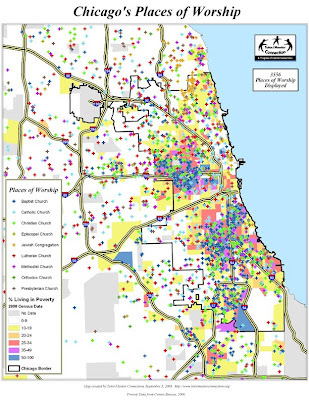 You can also help us continue to produce maps and strategies that provide community assets, like faith-based groups, with new ways to help the poor and needy - either in their congregation, or in neighboring communities. The maps you support are gaining the attention and recognition of important leaders. Don't let this momentum die! 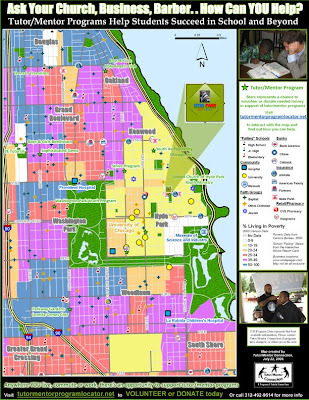 Just recently, this map was hung in President Obama's barbershop, and currently generates discussion, action, and heightened community awareness and involvement... pointing Hyde Park's citizens and community leadership (and maybe the President himself when he needs a trim) to existing tutor/mentor programs that need support through volunteers, student recruitment, supplies/talent, and funding. But ultimately, it's YOU that can make a difference - big or small... our maps show YOU how you can find a program that helps students in Chicago near your home or communter stop... these students are YOUR future employees and neighbors... future participants in the Democratic process... future leaders with the innovative and creative minds needed to help think outside the box and address the national and local issues that affect us all. Help us keep making maps to draw support and continue rallying attention to these important programs. 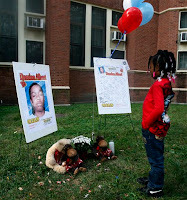 Donate to our fundraiser today... $5, $10, $25... whatever you can afford to offer. Remember, it's tax deductible - we're a non-profit organization! We’ve been running a Map-A-Thon to raise $5000 before October 15, in order to continue Mapping For Justice. 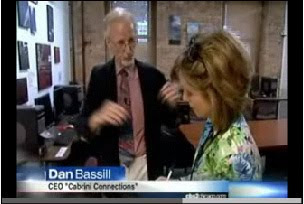 This past week, CBS dropped by to interview Dan Bassill, president of Tutor/Mentor Connection. 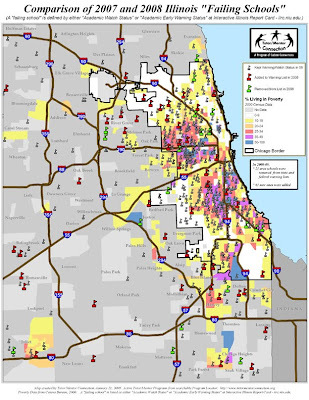 Dan says a few words about why "we're broke," but they also do something that is far too uncommon... they use their media reach to focus on why tutor/mentor programs like Cabrini Connections (one of 140+ programs I feature in my maps) are vital. Watch it to meet a few of the kids and learn from CBS coorespondants and the kids themselves why this is a program that needs your support. At the time of this posting, we’re only about 1/4 of the way there. We need more help! I’d also like to bring attention to some of the people who have found creative ways to help. Thanks again to CBS for taking time to give you an inside look at a tutor/mentor program, but again, this treatment from a selective media is rare. We need to spread the word the old fashioned way - by joining hands and promoting important causes with grass-roots techniques. Even if you’re out of work or dirt poor or whatever, if this is a cause that interests you, you can help spread the word, create a discourse, and mobilize action. The Dakota Inn in Alsip, IL, for instance (map of Alsip coming soon! ), took a night and promoted a bean-bag tournament, with the procedes going to Mapping For Justice. The customers of this biker bar rode in on their Harleys, entered the tournament, had fun, and learned about what we do. The process toward change can’t begin without those who want to help knowing where to turn. The beanbag tourney guided locals to the maps. The maps guide them to programs. This is the way this country worked for almost 200 years prior to CBS News and text messaging. This is grass roots organizing at a public place. Thanks to Debbie and Angele at Dakota Inn for creating a community meeting on behalf of community issues! But we’re in the digital age, love it or not, and most of us spend more time in fromt of computers and TVs than we do at bars and town halls. Gregg Ott used his personal blog to spread the word to his network. This is something you can do for free. You all have Facebook and/or blogs, right?... Social Networking on behalf of the community... Cross-promoting your causes with ours... Strength in numbers! Thanks, Gregg! Thanks again to everyone who has taken the time to learn about what we do, use their social networks to advocate on behalf of our cause, and help us meet our fundraising goals. And please donate and spread the word today, so that we can continue Mapping For Justice! We're only 1/4 of the way there!